We offer free city maps and cable TV. The towels are included. ingredients to cook a delicious Italian meal. 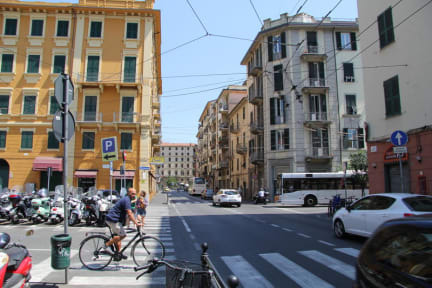 Besides all this you can also visit other places from la Spezia using the urban and suburban public transport. River 44 has a living-dining room, a small but full equipped kitchen, a bathroom and 2 bedrooms; The rooms are clean and soberly furnished. Check in at 10:00 . This place is as it proposes to be: funky but fine. Ideal location to train station. Safe and secure. On 4th floor and no lift. An apt turned into a 6 bed female and male hostel. Everything about the place as well as the furnishings is outdated. However, everything works great: toilet, hot water, gas stove for cooking, frig. And it is CLEAN! Clean, safe, quiet. Funky but fine. Plus the coffee shop directly around corner to the left serves up a great cafe latte! I was pleased with the set up. It wasn’t a traditional hostel. Just an apartment with bunk beds, but it was clean and spacious. Shower was difficult; water temperature would change on you. Lovely, cosy hostel that is very clean and tidy. All facilities needed are provided. The hostel owner was also very kind and checked me in at a wuite late time due to me having transport issues. Only a four bed hostel (one room) however gives you a fair bit of privacy. 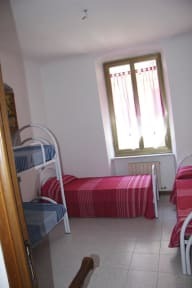 Very close to train station and a great base for cinque Terre. As there is no reception, I recommend having a firm arrival time and access to contact the owners (details on your booking info) to organise the place to be open for you to check in. Thanks for the stay! Perfect location for hiking Cinque Terre. Only 5 minutes walk to the train then easy access to all the villages without the hassle of dragging luggage around. Has a kitchen if you feel like cooking or plenty of food options just down the road. As the reviews state it is an apartment and one of the bedroom has 2 bunks (not an issue). Perfect location! 2min walk to the station and right at the end of the main high street. Doesn't have a hostel atmosphere (off season) but the town of La Spezia has no purpose other than be a base for Cinque Terre, there are no bars for you to hang out in. I was the only person in this place for 2 nights and got much needed rest for the hike. Make sure you email the host with your arrival time. This is more of an air BNB apartment rental, two shared rooms in an apartment. I wouldn't count on a good atmosphere, I was lucky I liked my roommates. No microwave, no laundry, but other than that everything you should need. Very close to the train station, I would consider it a convenient place to sleep while seeing Cinque Terre, not much more. Honestly, we have no idea how the hostel got such a good rating rate. The front desk was very warm and friendly, the location also top - right on the train station. The room itself was fine for a stopover but the kitchen, the bathroom, the hallway is dirty and you would rather not cook. The price of the accommodation is not justified. We did not really feel well.